Property Size 1,278 sq. ft.
Come and relax in this wonderful, bright three bedroom condo at Ventana Vista. This fully furnished condo is just the spot to spend your vacation. 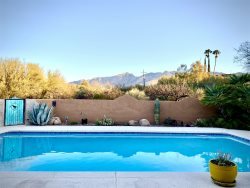 The gated community of Ventana Vista is less than one mile south of Sabino Canyon, in the northeast part of Tucson. Hike, bike or walk to the canyon. Dining and shopping are just 7 minutes drive south to Tanque Verde Rd and Sabino Canyon. You may also walk to casual dining and convenience stores from the community. Enjoy all of the amenities of the community, all are open for you during your stay! There are no Guest Reviews at this time. Please try back soon. Cleaning fee of $150 applies. Security deposit is fully refundable.